This cartoon from the early 1830s satirizes temperance enthusiasts. A very large man sits alone at a table with his fat legs spread out before him, eating from an enormous dish. 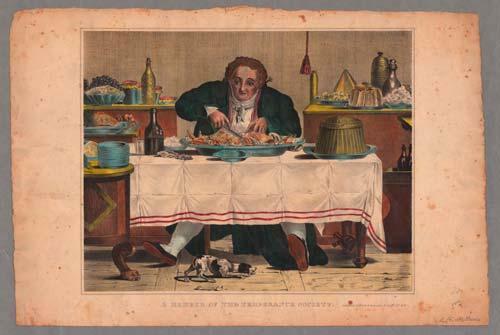 All around him, on the table and on five different sideboards, are heaping serving dishes and various jars and bottles, suggesting to viewers that this man's vice is food, not alcohol. Dimensions: 31.5 x 37.2 cm.